The tradition for a bride to wear a veil on her wedding day goes back hundreds of years so it's a good idea to understand why veils are so important, and to learn more about unique styles you can try out on your big day. There are many things brides do on their wedding day to bring a little good luck, but did you know wearing a veil was one of them? As well as being an elegant addition to your ensemble, the veil originated hundreds of years ago as a device used to obscure and disguise the bride from evil spirits that may try to meddle with a happy marriage. Roman brides actually used to don flame coloured veils to scare evil spirits away. Although the colors may have changed, for whatever reason, the tradition has stayed. In Victorian times, veils were a status symbol and royalty always had the longest trains. Today, the royals have a little more freedom to get creative with their wedding finery. 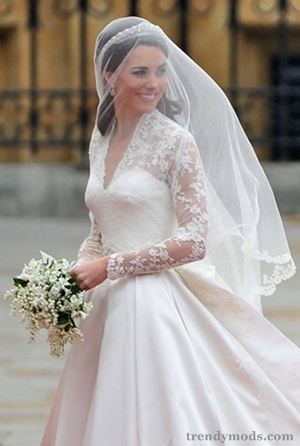 While the Duchess of Cambridge’s veil in 2011 ticked all the right boxes as classic, traditional bridal wear it also featured embellishment, cut and length that suited her own personal style. Crafted from 180cm of ivory silk with lace edges and affixed to a dazzling tiarra, Kate’s veil complimented the long train of her dress, which gave her Alexander McQueen outfit the royal edge it needed on such a big day. One of the most important considerations when selecting your veil is that it compliments your dress. Assess where the key focal points of the dress are to show them off in their best light. 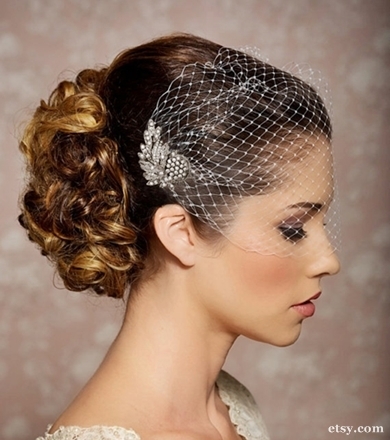 Short veils – known also as visor veils – don’t extend past the chin. If your wedding gown features high neck detailing, a short veil can be very flattering, and a sophisticated choice to wear with your gown. What's more, if you are getting married on the beach, there is no need to worry about this kind of veil getting tossed around by the sea breeze. If you want to refresh your wedding outfit, why not move away from tradition and follow in the footsteps of the fashion elite? When Kate Moss wed Jamie Hince married in summer 2011, the supermodel turned tradition on its head by wearing her veil as a cap, and adorning it with sprigs of flowers for a little bit of colour. Personalized details like this are what makes your wedding day all about you, and if you want to go "boho bride", but without the flower crown, this may be the perfect way to do it. Vintage bride is one of the most popular looks for ladies tying the knot this year, and selecting the perfect veil is an important part of achieving the look. Vintage gowns often feature a lot of pearl, lace, or diamante embellishment, so it’s often better to select a simpler veil that lets the dress do the talking. Affix your veil with a sparkling vintage hairpiece and voila – you are the perfect Great Gatsby bride. 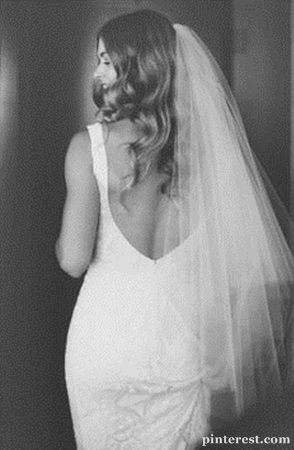 If you want a veil with that "wow" factor, then a floor length veil (or longer) is the best way to pull this off. At 72 inches in length, ballet length veils just brush the floor, so they are well suited to gowns that do not have a train. If you want to go all out, chapel and cathedral length veils can measure from 90 to 120 inches long! However, now that we are not worrying about evil spirits attacking us as we walk down the aisle, it’s also fine to have a full length veil that doesn’t go over your face. 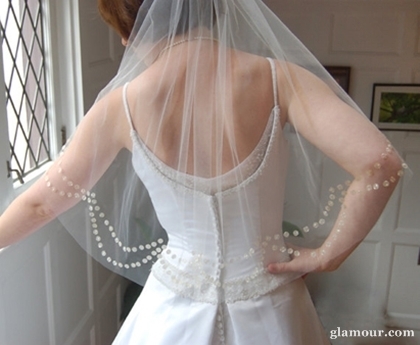 Simply pin the veil to the back of your head for an elegant effect.